A two-hour birthday party spent out in Dubai’s Cavalli Club managed to total a $108,357.80 bar tab (387,988 AED = Arab Emirates Dirham) according to the receipt published over Twitter this week. The party took place at Cavalli Club on January 2 and featured a bottle of Cristal at $34,033 as well as a cheaper item of a $33 birthday cake. 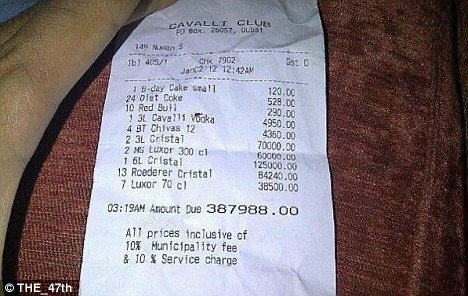 Doubted by some viewers in authenticity, a manager of Cavalli Club confirmed that the receipt showed a figure regularly seen at their tables. “Despite individuals and businesses feeling the effects of the downturn throughout 2011, Cavalli Club has seen high-spenders consistently frequent the venue,” David Lescarret, operations manager at the club told ArabianBusiness.com. “Last year saw an average of two tables per month spend between AED 200,000 to AED 500,000 in one night, and we expect this trend to continue into the New Year,” David Lescarret said. Other items on the guests’ receipt include one 3-liter Cavalli vodka at $1,347.70, two 3-liters of Cristal at $19,058.48, and 13 Roederer Cristals at $22,935.52. It can be assumed that there was more than one person behind this bill but the manager of the club would not give specifics on their spenders. Of the $108,357.80 total, the receipt reminded a 10% municipality and service charge fee would be added. Those fees, together, would equal an extra $21,671.56.